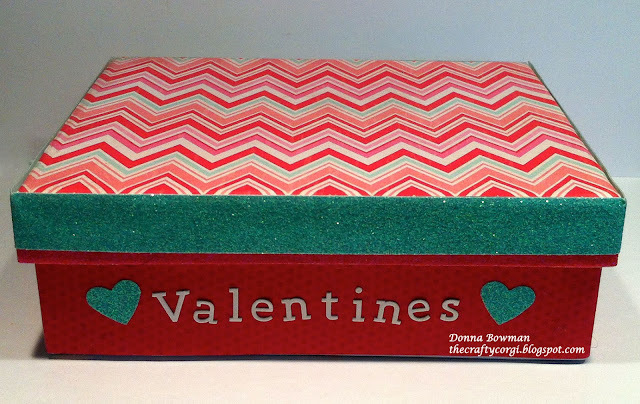 Welcome to Day 2 of The 7 Days of Valentine Projects Blog Event. Several crafty bloggers and I are posting Valentine projects every day for 7 days - just for fun. We’re posting projects we made using products we like and hope they will give you some inspiration for your own Valentine craft projects. You will find links to all the other participating bloggers below. Hopefully you can find time to look at their blogs and leave comments on any that inspire you. Happy Valentine Crafting and be sure to check back tomorrow for more Valentine inspiration! Today I'm showing a Valentine Card Box. It's the perfect thing for kids to take to school to put their Valentine's in. Normally there is a slit in the top of the box, but the box I used is very thick and I couldn't bare to mess up that beautiful paper!! To make this I covered an empty stationary box (I never throw those things out any more) with decorative papers. The lid is a chevron print called Lucky in Love by My Minds Eye and the bottom is covered in XOXO Funny Valentine by American Crafts. For the sides of the lid I used my new favorite craft item - GLITTER TAPE!! I can't get enough of this stuff and I won't even discuss how many colors I now own. I LOVE it!! I covered the bottom in Taffy glitter tape and it didn't quite reach the top so I added another layer of tape on top in Aqua. All my glitter tape is from American Crafts. For the front side of the box, I used white Basic Grey letters and for all the hearts I just punched hearts out of the glitter tape and added them to each side of the box. The punches I used were both from Stampin' Up. Thanks for stopping by and if you are encouraged to make something from a project you see along the way, please let us know. We would love to see!! Super fab! Love all that yummy chevron goodness... and who can resist the sparkle of glitter! Your projects are so varied and so perfectly constructed. I love that glitter tape!